Recombinant fragment corresponding to Human CTNNA1 (N terminal). IHC: Human tonsil or bowel tissue. WB: HeLa cell line. This antibody gave a positive result when used in the following formaldehyde fixed cell lines: HeLa. 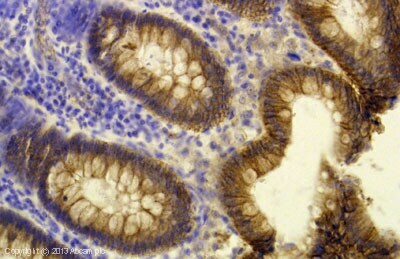 IHC-P (FFPE): Human Colon (Normal) tissue. Our Abpromise guarantee covers the use of ab49105 in the following tested applications. IHC-Fr 1/50. Acetone fixation recommended. IHC-P Use at an assay dependent concentration. High temperature antigen unmasking technique using 1 mM EDTA (pH 8.0) recommended. IHC image of CTNNA1 staining in Human Colon formalin fixed paraffin embedded tissue section, performed on a Leica Bond system using the standard protocol F. The section was pre-treated using heat mediated antigen retrieval with sodium citrate buffer (pH6, epitope retrieval solution 1) for 20 mins. The section was then incubated with ab49105, 5µg/ml, for 15 mins at room temperature and detected using an HRP conjugated compact polymer system. DAB was used as the chromogen. The section was then counterstained with haematoxylin and mounted with DPX. CTNNA1 was immunoprecipitated using 0.5mg Hela whole cell extract, 5µg of Mouse monoclonal to and 50µl of protein G magnetic beads (+). No antibody was added to the control (-). Proteins were eluted by addition of 40µl SDS loading buffer and incubated for 10min at 70°C; 10µl of each sample was separated on a SDS PAGE gel, transferred to a nitrocellulose membrane, blocked with 5% BSA and probed with ab49105. ICC/IF image of ab49105 stained HeLa cells. The cells were 4% formaldehyde fixed (10 min) and then incubated in 1%BSA / 10% normal goat serum / 0.3M glycine in 0.1% PBS-Tween for 1h to permeabilise the cells and block non-specific protein-protein interactions. 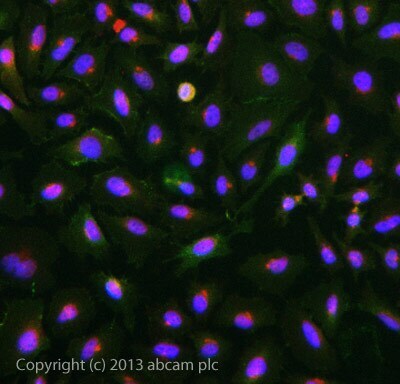 The cells were then incubated with the antibody ab49105 at 10µg/ml overnight at +4°C. 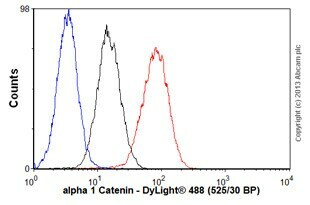 The secondary antibody (green) was DyLight® 488 goat anti- mouse (ab96879) IgG (H+L) used at a 1/250 dilution for 1h. Alexa Fluor® 594 WGA was used to label plasma membranes (red) at a 1/200 dilution for 1h. DAPI was used to stain the cell nuclei (blue) at a concentration of 1.43µM. Immunohistochemical staining of alpha catenin in paraffin embedded human appendix tissue using ab49105 at 1:50 dilution following high temperature antigen unmasking technique using 1mM EDTA (pH8.0). 60 minutes primary antibody incubation at 25oC. Standard ABC technique. Note intense membrane staining of the mucosal epithelial cells. Overlay histogram showing HeLa cells stained with ab49105 (red line). The cells were fixed with 80% methanol (5 min) and then permeabilized with 0.1% PBS-Tween for 20 min. 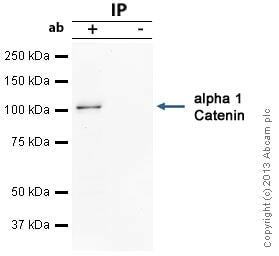 The cells were then incubated in 1x PBS / 10% normal goat serum / 0.3M glycine to block non-specific protein-protein interactions followed by the antibody (ab41905, 1µg/1x106 cells) for 30 min at 22ºC. The secondary antibody used was DyLight® 488 goat anti-mouse IgG (H+L) (ab96879) at 1/500 dilution for 30 min at 22ºC. Isotype control antibody (black line) was mouse IgG2a [ICIGG2A] (ab91361, 1µg/1x106 cells) used under the same conditions. Unlabelled sample (blue line). Acquisition of >5,000 events were collected using a 20mW Argon ion laser (488nm) and 525/30 bandpass filter. Publishing research using ab49105? Please let us know so that we can cite the reference in this datasheet. There are currently no Customer reviews or Questions for ab49105.